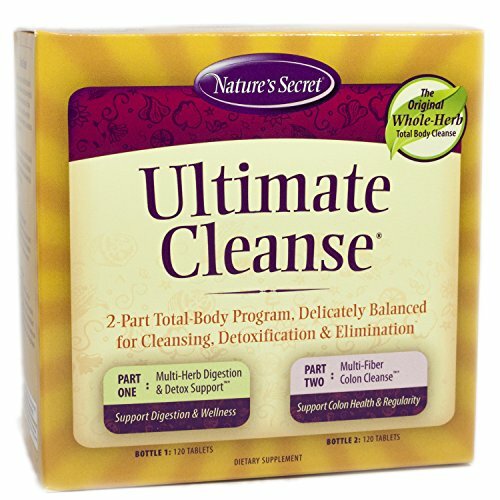 Nature’s Secret Ultimate Cleanse 2-Part Total-Body Detoxification Program with Wellness CD!Less bloating. Free!The original & natural whole-herb total body cleanse.Delicately balanced for cleansing & elimination.Part: Multi-Herb Digestion & Detox Support. One: 120 tablets.Support digestion and wellness.Part: Multi-Fiber Cleanse. Two: 120 tablets.Support colon health and regularity.No synthetic, magnesium, hydroxide.Dietary supplement.